Mid-week market update: most of this rally (see Embrace the blow-off, but with a stop-loss discipline published last November), but the scale of the unrelenting grind-up has been breathtaking. I have run out of words to describe “extreme” and “unprecedented” conditions. 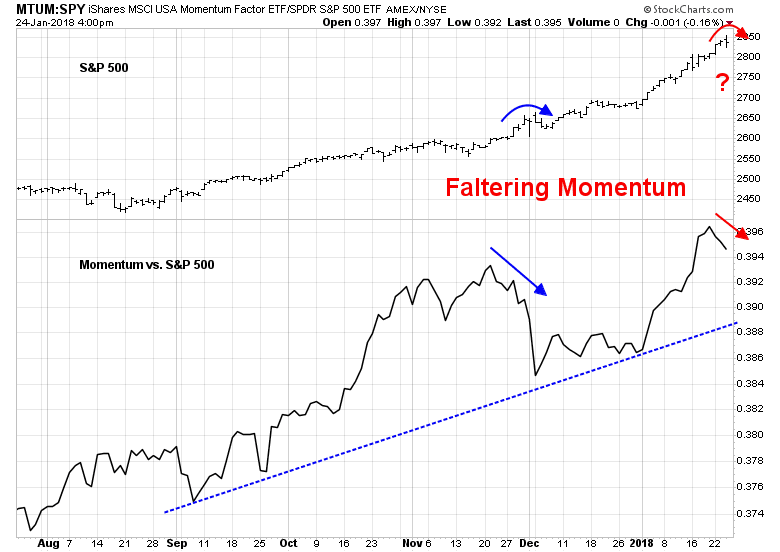 In short, the market has been dominated by momentum. Josh Brown recently highlighted analysis by Ari Wald outlining the positive price momentum gripping the stock market. 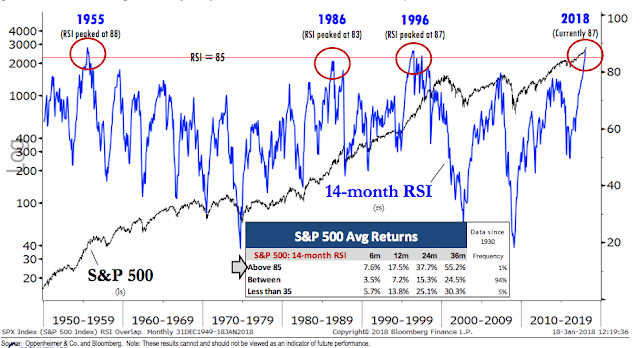 The high level of monthly RSI readings is indicative of a “good overbought” condition that has led to further gains. Positive momentum can also be seen from a fundamental viewpoint as well. 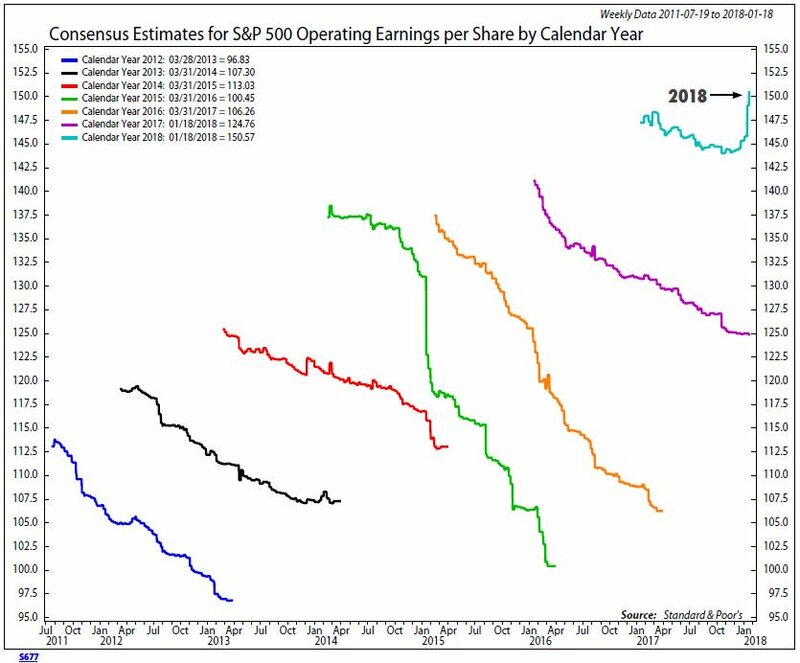 Ned Davis Research observed that bottom-up aggregated FY2018 EPS has been displaying the unusual pattern of a surge in upward revisions. Historically, Street analysts have tended to be overly optimistic and publish overly high EPS estimates, and revise them downward as time passes. The upward revision was undoubtedly related to company guidance of the effects of the recently passed corporate tax cuts. 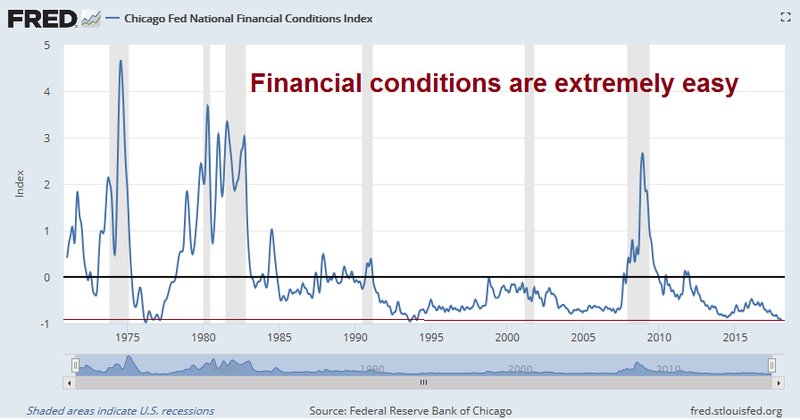 Despite the Fed’s tightening bias, financial conditions have also been extremely easy, which is also supportive of the market’s risk-on tone. When will this all end? It may be soon, as some cracks are appearing in the foundation of this rally. As the market’s surge has been led by price momentum, one warning flag appeared this week when the price momentum factor began to falter. Even as the market rose, the price momentum ETF (MTUM) began to lag the market. The last time this happened was in late December, and it led to a minor pullback in early January. This time, the pullback may be deeper, but a full correction cannot be confirmed until the relative uptrend line is violated. J. Brett Freeze of Global Technical Analysis identified a condition of monthly upside exhaustion in ES futures. That’s another warning flag. 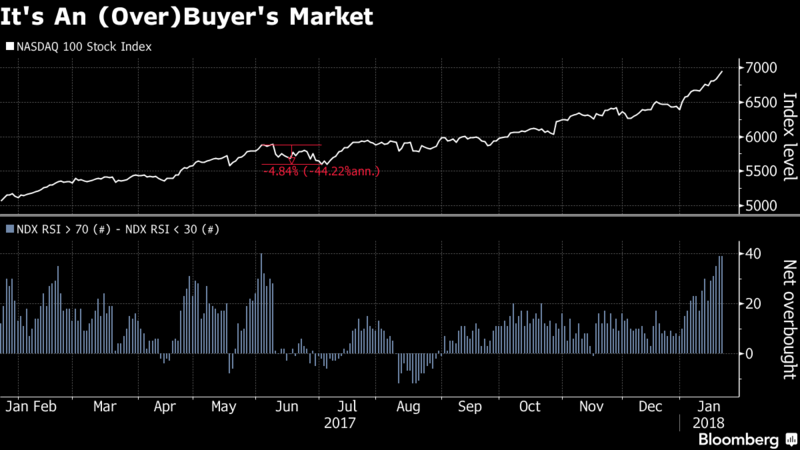 A net 39 of the Nasdaq 100 Index’s constituents are trading at a relative strength above 70 — the most since June 2. The last time the group was flashing an overbought signal that strong, the tech-heavy gauge took a 5 percent tumble over the next month. There are also indications that fundamental momentum, as measured by 2018 estimate revisions, are due to stall soon. As I pointed out last weekend (see Bubbleology 102: What could derail this momentum driven rally? 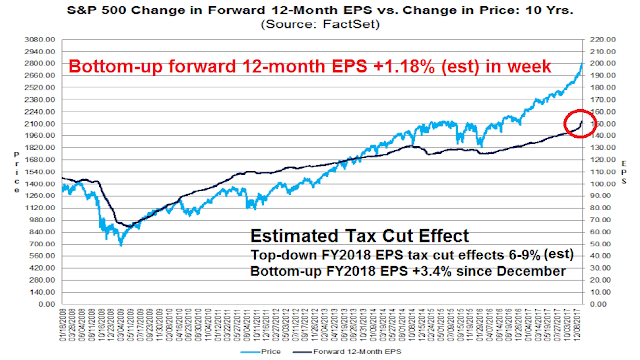 ), bottom-up FY2018 EPS is up 3.4% since the passage of the tax bill in December. While bottom-up analysts have hesitated to raise their estimates without precise guidance from their companies, top-down strategists have not hesitated to do so, and they have penciled in a one-time 6-9% boost to 2018 earnings from lower taxes. At the current rate of about 1.2% per week, bottom-up estimates should catch up to top-down estimates in about 2-3 weeks. Readers should therefore expect positive estimate revision momentum to die down about the first or second week of February. As well, a number of macro developments, such as the emergence of a possible trade war, is appearing (see Sleepwalking toward a possible trade war). 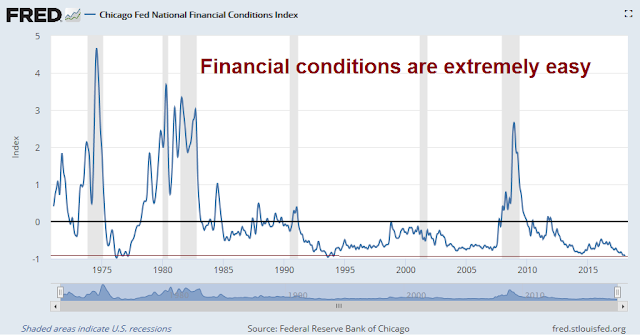 The risks of some nasty surprises are rising and traders are advised to, at a minimum, take some profits on their long positions. MTUM probably started to lag because traders were preparing for possible negative surprises from the ECB meeting and the Trump speech at Davos, after those two events went by without anything for the bears to build on MTUM rallied again on Friday. I remain skeptical about shorting the market here, with AAPL down $10 it is difficult to argue that everything is overbought. AAPL and a lot of its suppliers have corrected already, iPhone sales need to be real bad for these stocks to fall further.